We are a leading Exporter of embroidery work salwar, exclusive designer embroidery party wear suits, designer patiyala suits, designer womens suits, designer patiyala suits and designer anarkali suit from Chennai, India. We are a remarkable entity, engaged in manufacturing, exporting and supplying a stunning collection of Embroidery Work Salwar for our clients. Our offered fancy suit is beautifully stitched by our skilled designers using skin-friendly fabric and modern stitching techniques in line with the latest fashion trends. We are the renowned manufacturer, exporter and supplier to offer a wide range of Designer Suit to our prestigious clients. Offered suit is uniquely designed by our skilled professionals using the best grade fabric and modern technology. Keeping in mind the diversified needs of our valuable clients we bring forward the qualitative range of Designer Patiyala Suits. Available in various beautiful prints, colors and patterns, our provided suit is widely appreciated by our prestigious clients. We are engaged in the manufacture, trade and export of an unlimited selection of Designer Womens Suits. The presented collection is widely demanded in the market for its exquisite designs, long lasting finish and skin friendliness. The offered collection is manufactured using quality grade fabric and efficient machines for better results and long lasting finish. Being pioneers in the industry, we are engaged in offering a wide range of Designer Patiyala Suits. These are shrink resistant in nature and are well known due to their excellent quality. Offered products are developed by our vendors using superior quality fabric and advanced technology. We offer these in various eye catching colours at very affordable prices. To meet the diversified needs of our prestigious customer, we are manufacturing, exporting and supplying a beautiful range of designer anarkali suit. Our knowledgeable designers keep in mind the latest market trends and make use of high quality fabrics to stitch this suit. Our organization has successfully expanded its business in the market owing to the offered elevated quality array of Designer Suit that will add captivating and ethnic look to the wearer. The offered suit is tailored using premium quality fabric and sophisticated technology by our adept professionals. Our firm is specialized in manufacturing, retailing, trading, wholesaling and supplying an exclusive collection of Fabulous Designer Suits so as to suit all occasions, the offered range of wedding wear suit is available in various shades, patterns and colors in order to fulfill the requirements of the patrons. We procured the best grade fabric from the reliable sources in the market for manufacturing this wedding wear suit. Our focus is on stylized, Designer Suit whether it is churidar with an asymmetric spaghetti kameez. 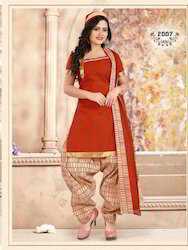 We offer salwar suits that are every womans dream. We use several textures and variety of fabrics in the same suit to make trendy, highly function but affordable designer salwar suits. Leveraging upon our brilliant quality infrastructural as well as highly qualified and trained manpower facilities, we are able to bring forth to our clients one of the finest grade Designer Suit. We are wholesalers and dealers of Designer Womens Suits. 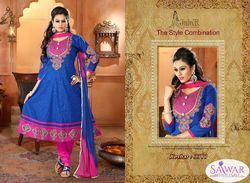 Our clients can avail this Georgette Suits for a kind of casual look. These georgette Suits are known for their quality and comfort. We offer these Suits in different designs and patterns as per the choice of the clients. We are committed to serve the choice of our clients with some of the most stunning designs and so we hire some of the most experienced designers, who have in-depth knowledge about the color combinations for these Suits. Keeping in mind the diverse requirements of our esteemed clients, we are offering a fancy range of Exclusively Printed Salwar that makes women striking and stunning. Our offered suit is designed by experienced designers with varied decorative patterns using soft quality fabric. With the support of our skilled and creative designers, we are affianced in manufacturing, exporting and supplying an elegant collection of Patiyala Suits. Goes well with heavy kundan jewellery and studded heels, this suit provides an extraordinary look to the one who wears it. Yaseen Tex bring forth an impressive collection of Straight Cut Salwar Kameez that is designed by our deft designers. The range of ladies designer suits offered by us is highly in demand in the market and possesses no other alternative. These suits are a perfect blend of traditional and contemporary designs. In addition, all the suits made available by us are in sync with the latest fashion trends. With the aid of our in-house quality designers, we have introduced Umbrella Salwar Kameez under the specified apparel range. These suits are available in a wide and appealing collection as presented in exceptional designs and with perfect finish. We use finest quality fabric & latest technology while carrying out the designing procedure and make our deliveries in a convenient way. Looking for Designer Suits for Ladies ?